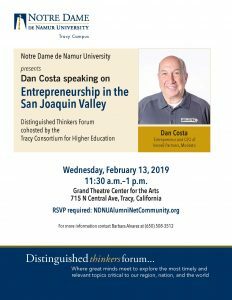 Join Notre Dame de Namur for special guest speaker Don Costa speaking on Entrepreneurship in the San Joaquin Valley. This distinguished thinkers forum will take place on Wednesday February 13th from 11:30 am – 1 pm at the Grand Theatre Center for the Arts. RSVP required please visit NDNUAlumninet community.org.